After writing so many posts recently about condo buildings that have recently come online, or "delivered", it's easy to become cynical about high-priced condos and the speculators who bought them in 2004/2005 hoping to make a quick buck by flipping them before the ink dried on the closing documents. 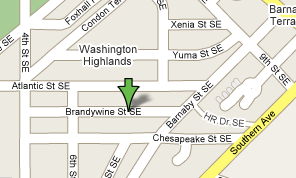 However, not all developers are targeting the market that can swing a $750K mortgage for a place with street parking. Development activity is underway, much of it in SE DC, to build affordable homes for people who otherwise would never be able to buy a place in the District. One such development is Brandywine Crossing. Moments after she signed the papers to purchase a condominium in Southeast Washington, Denise Kuenzel thanked the man who rehabbed the brick building and made it possible for her to own her first home. Then, after he left the room, she broke into tears. A rehabilitated building at what is now called Brandywine Crossing, where Denise Kuenzel [...] was able to purchase her first home. "I really appreciated that he made these affordable," said Kuenzel, 43, a secretary for the U.S. Postal Service. "It was just so profound. If he hadn't made these, I wouldn't have been able to buy." The subject of her gratitude was developer David Tolson, who invested nearly $11 million to transform eight dilapidated and dangerous buildings in Washington Heights into Brandywine Crossing, affordable condominiums for working-class men, women and families. The units range from $149,900 to $269,000. "There's a great demand for workforce housing," Tolson said. "It's for people like the guy picking up the trash or the single mom, places they can afford." Through January 2007, 42 units have been sold. According to the District's real property assessment database, 16 units have either not sold or had their sales recorded by the District. No condos purchased at Brandywine Crossing have been flipped. Keith, you need to us the price per square foot as the basis of comparison on your website. Using the price per unit is pretty meaningless. I wish I could. I use publically available data and the data you're requesting is not readily available to the public. 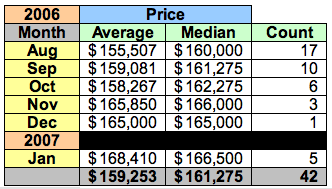 I'd like to use DC's CAMA data to calculate price per square foot and I'm checking into that. However, DC's data is woefully inadequate. For example, DC's CAMA data for condos, in a file dated December 2006 and that's updated quarterly, lists no condo sold later than July 2006 and even that is incomplete. None of the building's I've reported on recently are represented in the CAMA data and it may be months before they are. So I must resort to the same method used by MRIS: report counts and average / median prices calculated for a given type of housing. If you know of another data source for me, I'm all ears. My fiance and I bought a 2 BR condo. We love it! The neighbors are friendly and it's pretty quiet considering the zip code.